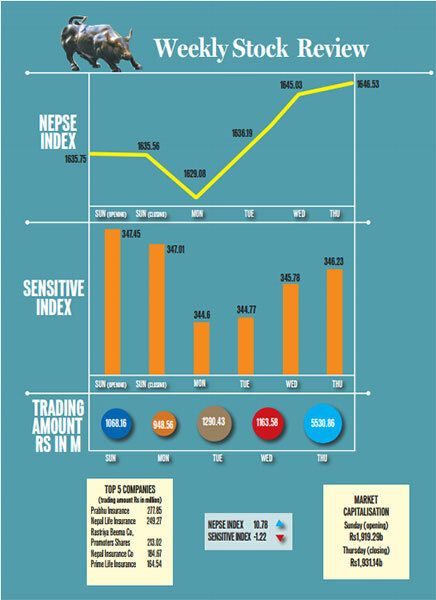 Jul 30, 2017-Nepal Stock Exchange (Nepse) gained 10.78 points to close at 1,646.53 points last week, after listed companies posted strong financial reports in the last fiscal year and attracted more investors. Similarly, the surge in demand for stocks of insurance companies also boosted the market last week. The secondary market that opened at 1,635.75 points on Sunday marginally declined by 0.19 points to close at 1,635.56 points. On Monday too, the market slipped 6.48 points to close at 1,629.08 points before taking an upward trajectory on the remaining trading days. On Tuesday, the market gained 7.11 points to close at 1,636.19 points. On Wednesday and Thursday, the market gained 8.84 points and 1.5 points respectively. Narendra Raj Sijapati, managing director of Kalika Securities, said the demand for stocks rose mainly as most of the listed companies had posted good financial report in the last fiscal year. “Similarly, many investors were attracted by insurance companies offering bonus shares and right shares to raise their capital requirement as prescribed by the sector’s regulator,” said Sijapti. The sensitive index that measures the performance of Group ‘A’ companies dropped 1.22 points to close at 346.23 points with a significant fall in the Nepse of commercial banks, the group that holds majority of shares in the secondary market. With a rise in the market index, the average value of the shares listed in stock market also went up Rs11.85 billion with market capitalisation reaching Rs1,931.14 billion. Of nine trading groups, six posted gain in their indices. Insurance gained the largest of 682.82 points to close at 9,675.93 points. Manufacturing was in second place, gaining 226.13 points. Rounding up the groups which posted gain were development banks (38.3 points), hotels (18.11 points), finance companies (8.89 points) and trading (1.35 points). The sub-indices of commercial banks, hydropower and ‘others’ were the losers last week. The index of commercial banks was the biggest loser, losing 29.31 points. Stockbrokers attributed the fall to oversupply of the commercial banks’ shares in the secondary market. Of the individual companies with largest transaction amount, all were insurance companies. Prabhu Insurance observed the largest turnover of shares worth Rs277.85 million. Sijapati said the increased selling of the insurer’s shares after the company’s right shares listed at the secondary market had resulted in the largest turnover of Prabhu Insurance. With a turnover of Rs249.27 million, Nepal Life Insurance was in second position in the segment. Promoters’ shares of Rastriya Beema Company, Nepal Insurance Company and Prime Life Insurance were also among the top five companies with largest turnover in the secondary market. Likewise, National Hydropower Company topped in terms of number of transaction, with 864,000 units shares exchanging hands. Last week, shares of 170 listed companies were traded. The transaction amount soared 16.75 percent to Rs5.53 billion. The traded number of shares also surged to 9,058,070 units from 8,753,880 units.